The loss of Samir Amin, who died at age eighty-six on August 12, 2018, leaves the world bereft of the greatest single theorist of imperialism of the late twentieth and early twenty-first century, and one of the leading world activists and organizers in today’s anti-imperialist struggle. Born on September 3, 1931, to an Egyptian father and a French mother, Amin emerged already in his twenties as one of the world’s foremost analysts of imperialism, with the writing of his 1957 doctoral dissertation, later published under the title Accumulation on a World Scale. Amin was to play a crucial, formative role in each of the four great periods of global political-economic analysis from the 1950s to the present: (1) dependency theory in the 1950s and 1960s; (2) world system analysis in the 1970s and 1980s; (3) the critique of neoliberal globalization beginning in the 1990s; and (4) the uncovering of the new age of global monopoly-finance capital since 2008. His mature political-economic analysis of capitalism is manifested in his Modern Imperialism, Monopoly Finance Capital, and Marx’s Law of Value (2018), but was already foreshadowed in Accumulation on a World Scale more than sixty years before. Amin was famous for his analysis of the disarticulation of peripheral economies as opposed to the autocentric development at the center of the system—a divergent reality created and perpetuated by colonialism and imperialism. This necessitated that third world countries delink from the imperialist world system. In the unequal exchange debate of the 1970s, Amin stood out in demonstrating that extreme levels of exploitation in the periphery could be traced to the fact that the differences in wages between workers in the global North and the global South were greater than the differences in the productivities, leading to the extraction of an enormous and growing economic surplus from the periphery. It was on the basis of this analysis that he was to erect his theory of unequal exchange. This, in turn, led to his critique of the globalization period, characterized by the global labor arbitrage, during which monopoly-finance capital, in the 1990s especially, began to shift production to the global South, leading to the accelerated extraction of economic surplus or imperial rent via multinational corporations. In all of his political-economic analyses, stretching over sixty years, Amin viewed his work as part of the same broad tradition of theory as that of Paul A. Baran and Paul M. Sweezy in Monopoly Capital: An Essay on the American Economic and Social Order (1966)—as well as in subsequent analyses of economic stagnation, overaccumulation, and financialization developed in Monthly Review in the 1968–2008 period by Sweezy, Harry Magdoff, and others. Out of this critique of world accumulation arose today’s analysis of monopoly-finance capital, or what Amin also called the new phase of “generalized monopoly capitalism,” marked by the Great Financial Crisis of 2007–09. It is, however, for his theory of imperialism and unequal development that Amin is best known. Among his foremost contributions was his reinterpretation of the entire history of world development in his book Eurocentrism—a term that he coined. In this work he engaged in a devastating critique of the classic linear stage model, whereby European-style feudalism was viewed as a necessary precursor in the transition to capitalism, with its absence in the East/South, thereby constituting a universalist explanation for the failure of capitalist development everywhere but in the West. In an enormously influential reinterpretation, Amin introduced the concept of the tributary mode of production, which, he argued, had its most complete development in China, constituting a more truly universal mode of production, of which European feudalism should be seen as a less developed form. It was the backwardness of Europe that gave it a historical advantage in the rise of capitalism. Nevertheless, the universality of the tributary mode meant that, if not impeded by imperialism, other regions were able to develop organically in similar ways. This was shown by the meteoric rise of Japan, the main example of a country never colonized or subjected to unequal treaties, which managed in the Meiji Restoration in the late nineteenth century to modernize rapidly and catapult itself into the center of the capitalist system. In the twentieth century, in contrast, this was only possible by means of revolution, and on a basis of worker-peasant alliances, as demonstrated by the Russian and Chinese revolutions. Amin’s focus on imperialism and delinking led to a more nuanced interpretation of Chinese developments. Never departing from his respect for Mao Zedong and hence critical of China’s subsequent “capitalist road to socialism,” Amin nevertheless continued to focus on China’s post-revolutionary status manifested in its: (1) construction of a national-sovereignty project arising out of the 1949 Chinese Revolution that allowed it to break through the imperialist cordon; (2) its resistance, duplicated in Vietnam, to the transformation of land into a commodity; (3) its retention of considerable state property; and (4) the persistence of a significant planning apparatus. The contrast between China and India, particularly with respect to the treatment of land, and the effect on the conditions of the population, was startling. Amin’s opening up of the question of China in this way has stimulated critical analyses of Chinese historical developments, contributing to the expansion of the debate on the left both inside and outside China, of which the articles in this issue of Monthly Review by Lau Kin Chi and by Zhiming Long, Rémy Herrera, and Tony Andréani are clear manifestations. An important aspect of Chinese development in the twenty-first century could be seen, Amin argued, in the conflict between North American imperialism, along with its subaltern European and Japanese allies, and China’s own sovereign project, which necessarily drove China toward South-South (and East-East) alliances. In this regard, China (along with the other BRICS states) was the inheritor, but in a changed historical context, of many of the aspirations of the Non-Aligned Movement, convened in the 1955 Bandung Conference, which remained an important reference point for Amin’s critique. Meanwhile, his reassessment of the Russian Revolution led him to believe that Russia’s role in opposing the hegemonic imperialism of the Triad (North America, Western Europe, and Japan) meant that its own delinking from the dominant world-capitalist system could reemerge, conceivably attached to a renewed movement for socialism—in other words, the ghost of 1917 remained a century later. The unusual clarity and complexity of Amin’s twofold critique of capitalism and imperialism, accounting simultaneously for economic, political, and cultural influences, as well as accepting historical contingencies, allowed him to explore the changing class and national dynamics throughout the world. He frequently singled out the historical specificities of nations and regions on a comparative basis, revealing new revolutionary possibilities and contradictions. But he was no less acutely aware of the growth of forces of reaction in what he called “the autumn of capitalism.” Thus, in an article in the September 2014 issue of Monthly Review, he led the way in sounding the alarm on “The Return of Fascism in Contemporary Capitalism,” providing analyses that today, four years later, can only be understood as prescient. 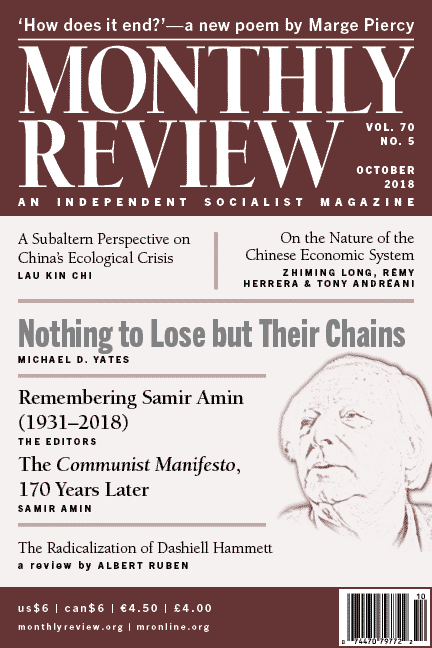 In July 2018, Amin, writing for International Development Economics Associates, presented one of his most trenchant analyses of the constellation of crises and contradictions of the present historical moment, in an article entitled “It Is Imperative to Reconstruct the Internationale of Workers and Peoples.” In this issue of Monthly Review, we are publishing his essay “The Communist Manifesto, 170 Years Later,” representing a reassessment, for our age, of the most important revolutionary document of all time. In it, Amin seeks nothing less than to explain the changing world trajectory from 1848 to 2018. This stands as a fitting conclusion to the work of a great revolutionary intellectual. Although Sherman writes in a deceptively simple, easy-to-read fashion that is accessible to anyone in this new book—as in his other works, going back to his 1968 Profits in the United States—his analysis, focusing on the business cycle, is extremely sophisticated. Most important is his treatment of what he calls the Inequality Ratio, or the ratio of profit income to employee income. Thomas Piketty, he notes, pointed to growing inequality in income and wealth in the United States and stopped there. In contrast, Sherman seeks to demonstrate the relation between this increasing inequality and increasing instability in the economy. The book is written partly in support of the new socialist (or social democratic) politics associated with Bernie Sanders and those he has influenced. It thus includes among its solutions a living wage, free higher education, and free health care for all. However, Sherman’s book is clearly meant to contest the system more fundamentally than does the Sanders New Deal-style program, in that it calls for a “democratic revolution” that will end the business-cycle boom and bust, constituting a fundamental challenge to “billionaire capitalism” as we know it.